Lianzhong Zhongfu Lianzhong Composites Group Co., Ltd. (LZ BLADES) was founded in 1987, belongs to China Composites and thus, it is part of the financially sound CNBM group. It has its headquarters in the city of Lianyungang, Jiangsu Province. Within the past 20 years the company has been developing into one of the nation’s key producers of composite technologies in China. Its main products include rotor blades, tubes, containers, high-pressure cylinders and high-pressure pipes. LianZhong Composites (LZ Blades) was certified to produce products to the ISO 9001-2000 quality standard, and also received API certification for its high-pressure pipes. LZ BLADES is permanently dedicated to developing technical innovations. With more than 20 product lines LZ Blades is a leading company in the field of winding technologies for pipes and tanks. The production capacity for FRC pipes and tanks is up to 20,000 tons per year. By adopting and installing winding equipment and technology for vertical FRC tanks with a high diameter LZ Blades has discovered and served a niche in the domestic market. In 2004 the company successfully manufactured a FRC tank with a diameter of 25,000 millimetres DN. Based on the Renewable Energy Sources Act the Chinese wind power industry is rapidly growing. In 2005 LZ Blades initiated a close cooperation with the current SINOI GmbH by producing 1.5 MW rotor blades. With an annual production capacity of 10,000 rotor blades LZ Blades has become Asia´s largest and one of the world´s leading manufacturers of rotor blades. 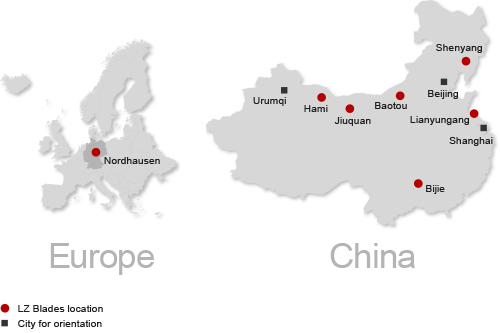 Nowadays it owns production sites in Asia (LZ Blades) and Europe (SINOI GmbH). SINOI is aiming at a continuous improvement regarding the quality of the rotor blades.